Want to leave behind the cold and the snow? Want to dip your toes in the warm waters of the Caribbean? Want to visit a tropical locale that’s off the beaten path — but not too far off? Want a place where you can sample unique cuisine and relatively cheap booze? Placencia, Belize, may be your spot. After two vacations at all-inclusive resorts in the Playa del Carmen, Mexico, area, my wife and I were looking for something different. We found a nice alternative in Placencia. • An ocean-front location. Placencia lies along the Caribbean Sea. We spent some time just stretched out in our beach loungers, watching the waves roll in. The tide only rises a couple of feet in Placencia, so the waves were small. Our beach was relatively narrow — it’s not the wide expanse of white sand you see in some places around the globe — and the sand was rather coarse. But to us, those weren’t big drawbacks. 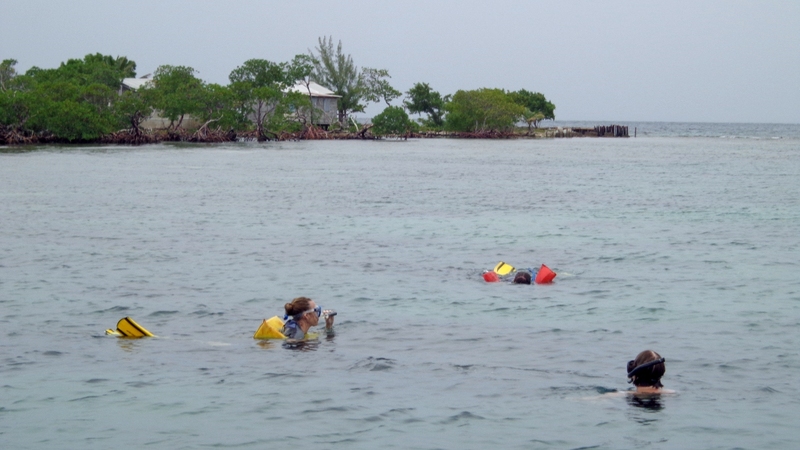 Snorkeling off Abigail Caye, which is about 8 miles offshore from Placencia. And we spent some time snorkeling. We swam off a nearby caye (pronounced “key”), and it was like swimming in your tropical fish tank. If snorkeling is high on your list, there are some other excellent spots in the area where you can see rays, turtles, sharks and all sorts of fish. And in general, Belize has some terrific places for snorkeling. • Your money goes a long ways. The Belizean dollar is pegged to the American dollar at a rate of 2-1, so it was like buying everything at half-off. 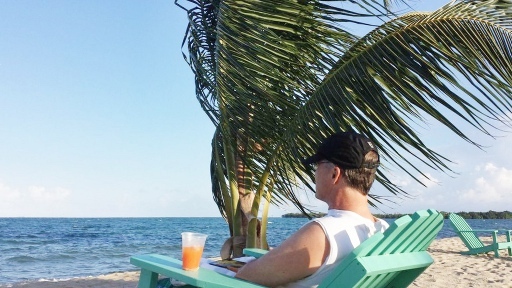 Chilling on the beach by the Seaspray Hotel in Placencia, Belize. An $8 bottle of rum and a $4 bottle of fruit punch can keep you relaxed for days. We went with another couple, and, if we didn’t get too many of the umbrella drinks, a night at our favorite bar cost us $20-$30. One night, we went out for a delicious fusion dinner at the Mojo Lounge; we went during happy hour, and they had a special on entrees that night, but we had 6 drinks and 3 entrees for about $40 a couple. • There’s lots to do besides just look at the ocean. We had planned to do a tour every other day, spending the off-days just lounging on the beach. But it was so cheap to take a daily tour and there was so much to do, we took four separate tours. 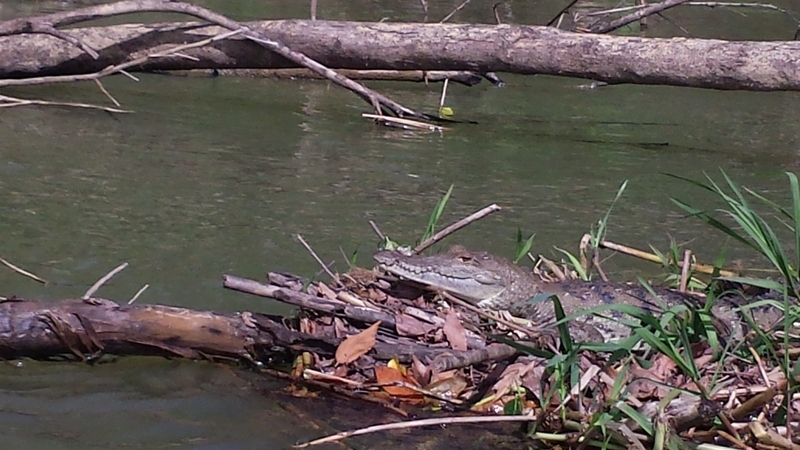 A crocodile suns itself in the Monkey River, which is about a 45 minute boat trip south of Placencia. One day we went to Monkey River, where we saw howler monkeys, crocodiles, a young boa and birds galore, plus ate an authentic Creole lunch at Alice’s Restaurant. Another day we went to a hidden waterfall and looked at a banana plantation and a teak and mahogany plantation. We toured two nearby Mayan ruins (Nim Li Punit and Lubaantan). 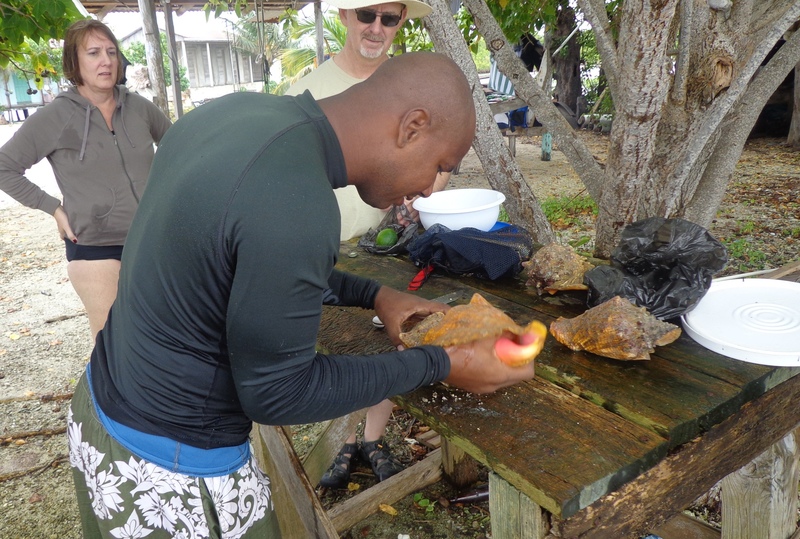 And we did the day of snorkeling, which also included a barbecue on the beach with fresh lobster and conch caught by our guide. Owner Shane Young prepares conch for a beach-side barbecue. Shane owns Pirates Point Adventure Tours. We’d recommend Pirates Point Adventure Tours for your day-trips. Owner Shane Young took us to Monkey River and the snorkeling trip himself, and he arranged for a colleague to take us on the Mayan ruins tour. And Shane’s partner, Rosario, hearing we were about to amble off to the waterfall by ourselves, rearranged her day so she could take us to the falls in her own vehicle. And after taking the backroads to the falls, we don’t think we would have ever made it there by ourselves. Shane and Rosario were wonderful hosts, and we can’t say enough good things about them. You can find their office along the famous Placencia sidewalk, just steps down from the Tipsy Tuna. • Your hometown away from home. I’m not sure I’ve ever felt more welcome while visiting another area. Belizeans in general and Placencians in particular seemed genuinely glad to have us visit. Placencia’s size may lend itself to the friendly atmosphere. There are only 750 or so residents there, and you’ll probably run into the same natives and visitors over and over again during your visit. 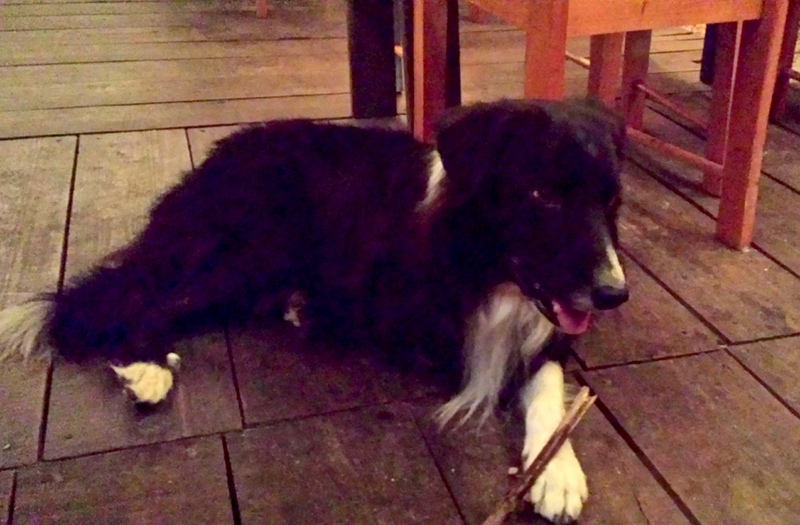 Ziggy the 3-legged border collie is the official mascot of the Pickled Parrot — if you don’t count the parrots. Nearly everyone we met on the sidewalk said “Good morning.” Waitresses, hotel workers, clerks were all grateful for our business; yes, that’s their job, but it seemed to go beyond that. I even passed the time of day with a high school-aged boy as I waited for my wife to finish shopping one night. Many businesses in Placencia are owned by expatriated Americans and Canadians. Big John and Betty (Pennsylvania) own Friends Near the Pier restaurant, where you’ll get the best tropical pancakes and lobster omelette you’ll ever eat. Patrick (California) has built The Flying Pig bar and restaurant just north of town, and that’s where I had my best drink of the trip — a Woo Woo, featuring lots of banana and coconut. Erin welcomed us to the Mojo Lounge, and wowed us with some terrific entrees. Fun at the Pickled Parrot. Lynn does the cooking, son Tommy was bartending and Eugene — what the heck does Eugene do? Oh, yeah, customer relations! And he does it very well. We made it a point to stop at the Parrot nearly every night for drinks and to watch American football. It was more like stopping by a friend’s house for drinks. On our final night before heading home, we exchanged big hugs with Eugene and wished the family well. We’ll see them all again when we return, and we may even root for the Philadelphia Eagles in their stead. • There are a lot of good places to eat. And most are very reasonably priced. Good food is really important to us. Really. Important. For such a small town, Placencia offers a great selection. As I mentioned, the Mojo Lounge was very good. We had a great conch chowder and thin-crust pizza at The Purple Space Monkey, which also had draft beer, which is a rarity in Placencia. Omar’s Creole Grub features fresh caught seafood prepared in simple but tasty ways. During our tours, we’d stop at the local, authentic cafes — because you only get authentic when you are off the beaten path. Authentic Belize food features a lot of beans and rice, stewed chicken or pork, and seafood. It’s tasty, filling and not overly spicy — unless you apply too much of the native vinegar slaw or hot sauce. We couldn’t get to all the good places that were recommended to us by the locals. But there will be other opportunities, I’m sure. • English is the official language. OK, I’m a dumb American who is horribly underschooled in the languages of the world. I accept this. But this region became the colony of British Honduras in 1862 and only gained independence in 1981, so there is a strong English influence. Communicating with the vast majority of people was no problem. • A fun marathon in a Caribbean locale. Obviously, this criteria won’t be a factor for many people, but my wife and I wanted to run a marathon in the winter in the Caribbean. We took part in the second annual End of the World Marathon on Sunday, Dec. 8, 2013. It was a blast and very well executed. For more on the race, see this review that I wrote elsewhere on my blog. Like many Caribbean nations, there’s a lot of poverty in Belize. Some of the natives are way off the grid, still living in houses with raw wood siding and thatched roofs. Electricity came to Monkey River in just the past couple years. That’s a challenge, not a fault. I hope that America, with our financial resources, will help. Supporting these areas with our tourism dollars is appreciated by the locals. You could throw your back out from riding in a vehicle along the backroads. But the isolation is part of the appeal. There was trash along the roads and along the beaches. Some of it is self-inflicted, I’m sure. In other cases, it’s trash that washes up from the ocean. The humidity was high; it’s hard to imagine what it would be like in July or August. Want a glitzy, glittering, sparkling tropical locale? Placencia probably isn’t your place. But if you want a laid-back location with good food and great people, find your way to Placencia. • Barb’s Belize for advice and travel arrangements. 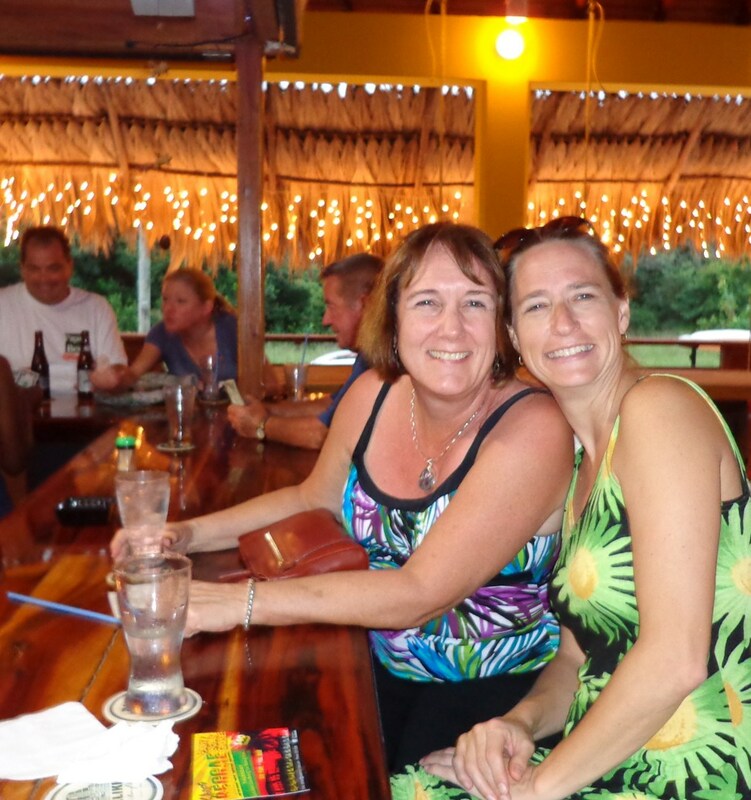 We had never travelled to an out-of-the-way location outside of the United States — and we had never been to Belize — so we appreciated the travel advice and arrangements provided by Barb’s Belize. Owner Barb Kasak made excellent recommendations on how to get there, where to stay and what to do once we got there. She was very knowledgeable about the area, and she was very accessible. In the end, we had her book all of our arrangements, and we’re glad we did. Bad weather caused a delay in the initial leg of our trip — from St. Louis to Houston. This caused us to miss our booked flight from Houston to Belize City, and we were afraid it was going to cause us to miss our flight from Belize City to Placencia. A quick email to Barb and a phone call, and she had booked back-up flights, checked on alternatives for an overnight stay in Belize City and talked us through the problems. In the end, she got us back on the last flight of the day to Placencia, and we were drinking Belikin beers on the beach by 6 p.m.
Seaspray Hotel room No. 7 looks right onto the beach, and all the Seaview rooms feature hammocks. • Seaspray Hotel in Placencia. One of our major concerns was finding a good place to stay. We weren’t looking for fancy, but we wanted a safe, clean place in a good location. The Seaspray Hotel was perfect. We stayed in one of the Seaview rooms and our friends stayed in one of the others. Their room featured a queen bed; ours featured two doubles (I would have preferred a queen instead of the two doubles, but it is what it is) and air conditioning. The room was clean, the service good. I’d recommend the Seaview rooms, which I believe are nos. 7-8 and 20-21. The end room, No. 13, was in a perfect location, as was the separate cabana. Our rooms were very reasonably priced. The other rooms were pretty small, but the prices were very, very reasonable. • Other useful links. Here is a good site that outlines many of the amenities and things to do, and here is an interesting Youtube video that shows the Placencia main road and shows some of the sights at Monkey River. I’m fairly geographically literate, but before our trip I couldn’t have told you whether Belize is a Caribbean island (it’s not) or located it on a map (here’s a map of Belize to help you). 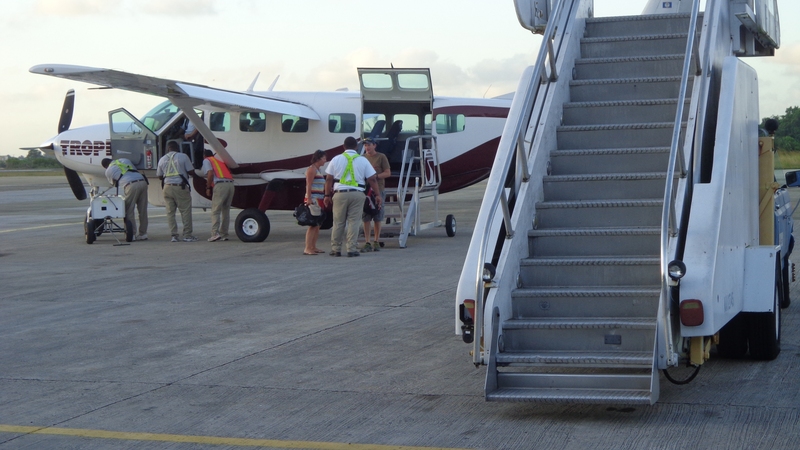 Tropical Air runs a 14-passenger Cessna on the milk run between Belize City and Placencia. Belize is actually a small country in Central America. It is located just south of the Yucatan Peninsula, where you will find the more widely known Mexican towns of Cancun and Playa del Carmen. Placencia village is located in southern Belize, literally at the end of a road — the Placencia Road to be exact. The Placencia Peninsula is about 16 miles long and, in some spots, just a few yards wide. 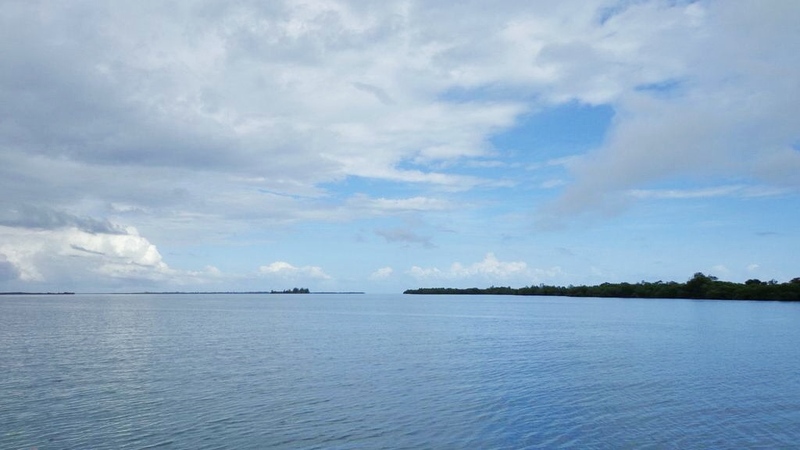 The Caribbean Sea is to the east of the peninsula, the Placencia Lagoon is the west. To reach there from the U.S., you’ll fly into Belize City. We flew from Houston, and it was about a 2 1/2 hour flight. From Belize City, you can reach Placencia by highway or by a domestic airline — Maya Island Air or Tropic Air, the carrier we used. While flying in-country, you’ll likely travel on a small Cessna. Our flight from Belize City to Placencia was about 45 minutes and offered a great view of the territory between the two towns and a very interesting view of the Placencia Peninsula.